Arguably the most mysterious of all gamefish, the swordfish is a deep-sea behemoth that prowls the abyss, occasionally coming to the surface to bask in the sunlight. This swordfish replica radiates that same enigmatic aura, imparting a sense of adventure and mystery to any setting it is placed in. The body of the swordfish is elongate and somewhat compressed. The upper jaw is very much extended, forming a long, flat sword. The color is dark gray to black above becoming gray to yellowish below. Swordfish are readily distinguished from other billfish by their flattened bills, lack of fins on the belly, and the presence of only one keel (small projection) on the base of the tail adjoining the fish. Swordfish occur worldwide in temperate and tropical seas. 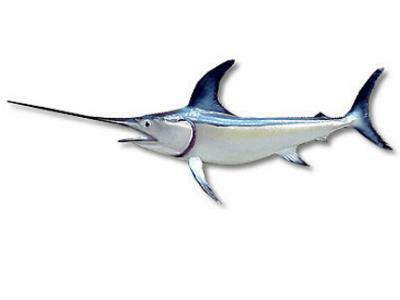 Like the other billfish, swordfish are a highly migratory species. They follow cooler water during summer and warmer water in winter. Swordfish are generally found in tropical regions of the Indian, Atlantic and Pacific Oceans and will spend most of their time between 600 and 2000 feet. This is a 1/2 mount meaning that the back side of the swordfish is not finished only one side is a finished fish. All returns subject to restocking fee and shipping is non refundable and most has been added to the price of the mount.